The Chapter looks toward another very successful Rush campaign this season. Parker Key '09 and Travis Hayes '10 are leading the effort, with the help of many of the new initiates. 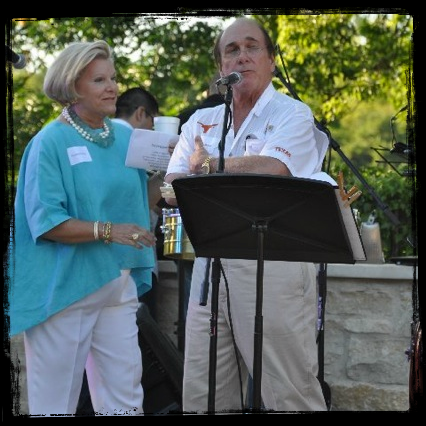 I wish all of you a happy and safe summer with a great UT football season ahead. 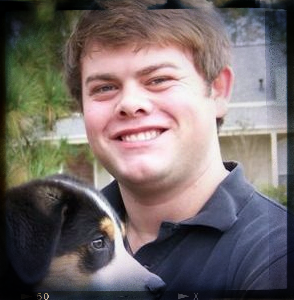 Graduating senior Ernest Hotze was chosen by the Chapter to receive the 2012 Michael O'Connor Award. This award was created to honor the senior who has best exemplified the spirit of Kappa Sigma brotherhood throughout his years as a Tau Chapter active. Hotze has been a Rush captain, GMC and grand procurator. He graduated with a degree in mechanical engineering and grew up in Houston. The Tau Trustees and Alumni agree that Ernest Hotze was an excellent choice for this award and extend their warmest congratulations. This year's winning team: Craig Valenta, Hayden Witte, Brax McCarthy and Cory Miller. 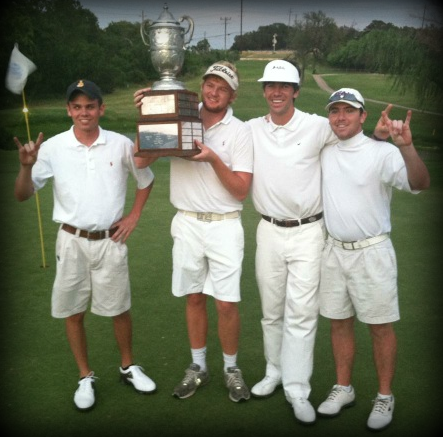 The Tau Open was held April 27 & 28 at Lakeway Country Club near Austin. Before we begin construction on the new Chapter House, we must reach our fundraising goal of $5 million. We're now only $1.4 million shy of reaching that goal in pledges. Tito Beveridge's formula for success goes beyond his ability to create the sublimely drinkable sipping vodka now famously known in all 50 states as Tito's Handmade Vodka. His big picture formula? Find your passion, find a way to do it better than anyone else is doing it and build a brand with your own personal story in a way that turns tasters into brand-loyal word-of-mouth promoters. 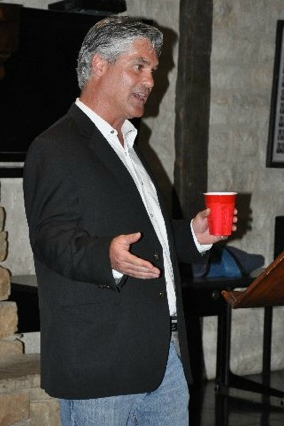 As guest speaker at the Kappa Sig Lodge on April 23, Tito shared the journey that brought him where he is today with a captivated audience of more than 100 Tau actives. A Kappa Sig who graduated from UT in 1984 with degrees in geology and geophysics, Tito worked in the oil and gas business in Texas and then in Venezuela and Columbia, where he ran heli-portable dynamite seismic crews. He returned to Texas and started a drilling company in Houston, but "got tired of chasing the buck" and moved back to Austin. Working in the mortgage business, he started making flavored vodka to give as Christmas presents to his friends. Enthusiastic comments from both friends and strangers who tasted his customized drink prompted him to take the leap from amateur to pro as a vodka maker. After would-be investors turned him down with nay-saying predictions that he would never get permits or never get a distributor, he used his personal savings and 19 credit cards to put himself in business. He engineered and built a production still on his own and served as a one-man production, sales and marketing force. Then a pivotal moment came with an invitation to the World Spirits Competition. Too busy to attend the competition himself, he sent a couple of bottles as entries. Not only did Tito's vodka place first, it won the double gold medal, the unanimous judges choice, beating out 72 other vodkas from around the world. Tito's numbers are impressive -- more than $60 million in gross sales made in 2011 alone. But what's even more impressive is the determination and optimism that fueled his efforts to launch his fledgling operation almost 20 years ago. Tito's Handmade Vodka is produced in Austin at Texas' first and oldest legal distillery. Made in small batches and micro-distilled in the same way as fine single malt scotches and French cognacs, it's designed to be savored by spirit connoisseurs and everyday drinkers alike. Tito lives in Austin with his wife, Lori, and their three children. We're very fortunate to have two outstanding, enthusiastic alumni now serving as fundraising co-chairs for the Tau 125 Campaign, Phase II: Bill Stubbs '81 of Houston and Joel Fontenot '81 of Dallas, who are both parents of current active members. They are deeply committed and highly motivated to help us reach the original $5 million goal necessary to start construction on the new Chapter House. Please make your first-time gift or additional gift to the 125 Campaign today to continue the Tau legacy that has served us all so well. 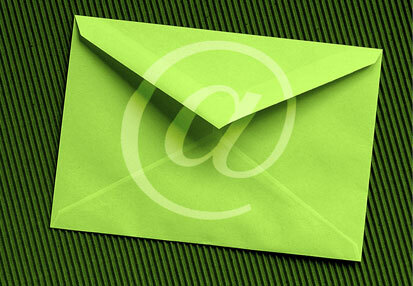 I know that many of you have already given and your generosity is deeply appreciated. Let's keep moving forward. Sometimes, an athlete's strongest motivation to improve isn't just his or her own personal best performance, but that of a fellow competitor's. And that was exactly the case for 76-year-old Robert Whilden. 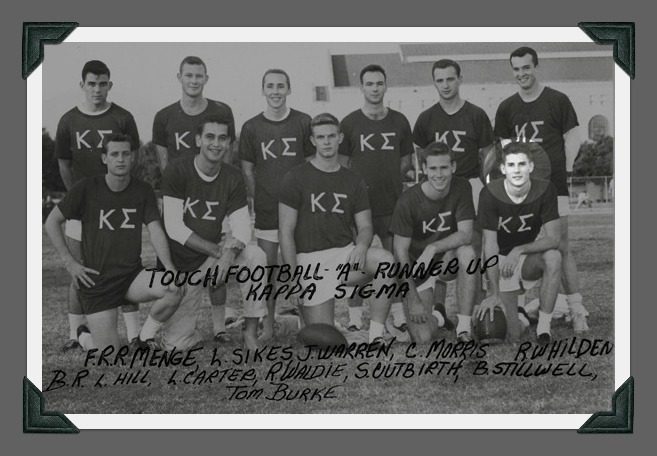 1958 Touch Football, Class A Runner-Up Kappa Sigma Front Row: Roy Arthur Menge, Larry Sikes, Johnny Richard Warren, Clifton Howington Morros Jr., Robert Harral Whilden Jr.
As a young track athlete, Whilden became involved in sprinting while attending Lamar High School, where he won the state championship in the 220-meter dash and second place in the 100-meter dash. He took his talents to the University of Texas and won the 100-meter dash event at the Border Olympics, West Texas Relays, Kansas Relays and the Southwest Conference Meet. With sprinting as his specialty, Whilden was a finalist for two events in the U.S. Olympic Trials in 1956. 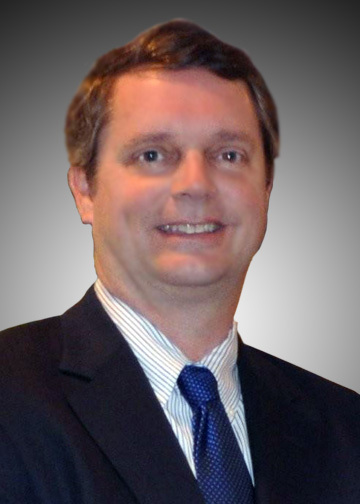 But after he graduated from UT, he went on to attend law school, landed a career practicing law with Vincent and Elkins and started a family with his wife, Mary. At the age of 39, Whilden had long since hung up his track shoes and hadn't competed in sprints since college. But his competitive fire was reignited when he just happened to read an article on Thane Baker's 100-meter dash win at the Masters. Baker's time clocked 10.7 seconds, and it left Whilden wondering if he could beat Baker's time. So he purchased a new pair of running shoes and started getting into shape. A year later, he was sprinting again, and he competed at the national Masters meet and won, tying the record at 10.7 seconds. From the age of 40 to 70, he never ran another meet. "I got my exercise through tennis and golf, but I never ran," he said. "I was never, even today, not just a fan of going out and running. Some people go out and run three to four miles or more. To tell the truth, unless I am in some type of competition, I don't consider just plain old running that much fun." Wouldn't you know it, at the age of 70, the competitive spirit in Whilden surfaced again. "I kept up with what was happening in the Masters meets and I started wondering if I got back in shape, could I beat the times of the winners? It took me over a year to get where I could really sprint again," Whilden said. He now competes in several state and national sprint events throughout the year. Recent accomplishments include a second place finish of 14.27 seconds in the 100 meters at the Senior National Games in Houston; 13.68 at the Penn Relays, and then a 13.55 in the 100 meters in the Huntsman World Senior Games in Utah, all happening in 2011. To stay in shape, Whilden practices with a group of runners at the Rice University track three days a week under the tutelage of Billy Collins, another famous Houston runner. "This guy deserves all the recognition you can give him," Collins said of Whilden, "one fantastic gentleman. Some runners think of all the different things they have to accomplish to become a better runner. For Bobbie, it's just perfecting the efficiency of his movements on the track. There are certain things as a coach you can't teach. They just have to be there. He has those talents; you just have to guide him." "I feel good all the time," Whilden said. "I'm not tired, my health is good. I'm never sick. I'm not going to say that this is all attributed to running, but I do think it's a major part of my staying fit. I don't want to stop again. It's hard to come back when you stop." 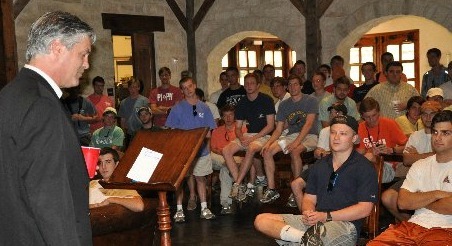 The Kappa Sigs were a strong and enthusiastic presence in this year's Longhorn Run held April 14. The event is organized by UT Student Government and features both a 10k and two-mile course starting and ending around 21st and Speedway near Gregory Plaza. Matthew Ziemnicki '08, former Tau Chapter Grand Master, organized a Kappa Sig race team that ran in memory of Patrick Scott '06 who passed away following a car accident last year. 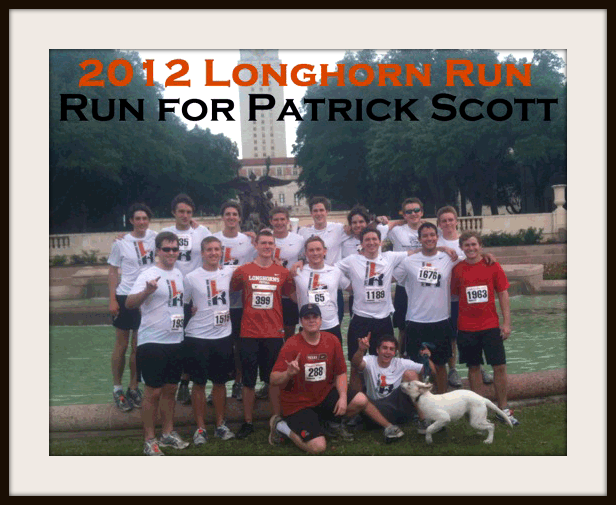 "We were honored to run this race in memory of Patrick Scott and as a tribute to him and his family. It was a special day for keeping Patrick in our memories and hearts," said Ziemnicki. Tau Chapter House Manager Nash Horne '10 serves on the Student Government executive board and helped organize this year's run. Proceeds from the race benefit the Excellence Fund, a Student Government endowment dedicated to student projects and programs. The Kappa Sigma Race Squad following the April 14 Longhorn Run. Grant Richardson '10, Will Stringer '10, Ryan Lord '11 and Shane Kruger '10. Wynn Doughtie '11, Scott O'Neil '09, Clark Martinez '10 and Michael Guenther '11. 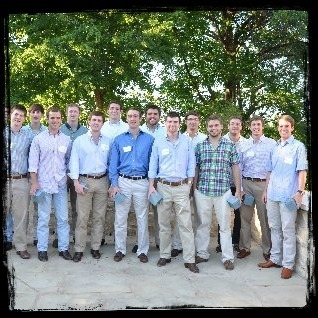 Bottom Row L to R: Matthew Ziemnicki '08 and Tyler Rush '09. Kappa Sig parents enjoyed a wonderful evening with their sons at this year's family social event held April 21 at the Lodge. 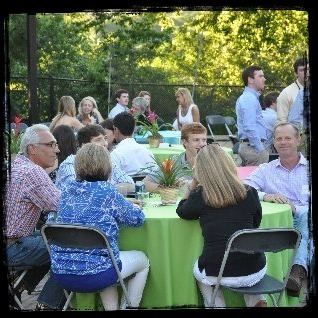 Kappa Sig mom Lisa Dunlevy did a beautiful job as event coordinator. It was a special time for all who attended. Parents' Association president Elizabeth Horne and Tau Alumni Hagen McMahon '66 welcome the guests. Fifteen graduating seniors were recognized and presented with silver engraved mugs. A gathering of about 300 people enjoyed the parents' dinner and festivities. 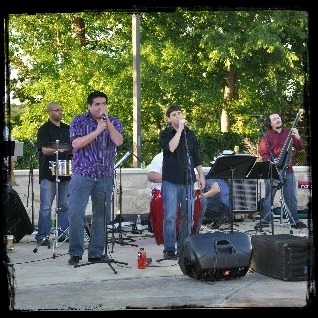 Salsa Band La Mona Loca filled the air with lively salsa music. 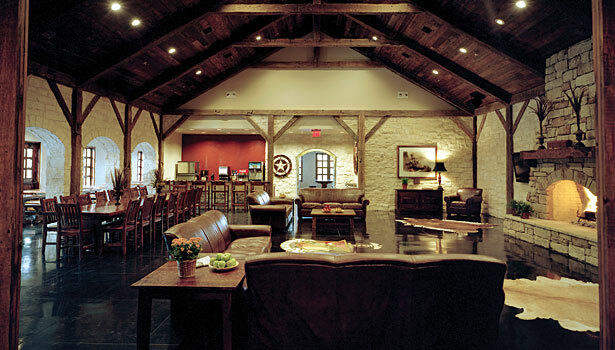 Rich in history while still anchored in its modern home at the University of Texas in Austin, the Kappa Sigma fraternity lodge is built of local stone that gives the house a rustic feel. Over the 11-month period of construction, the design goal was to take the 5,390 square feet of space and create a lodge-inspired dining/study hall while keeping the fraternity's unique history in mind. The brotherhood of Kappa Sigma began in 15th Century Italy and was founded as a society for mutual protection against the violence and robberies being perpetrated on students by the henchmen of a corrupt city governor. The design model for the lodge is deeply rooted in the fraternity's history and culture. 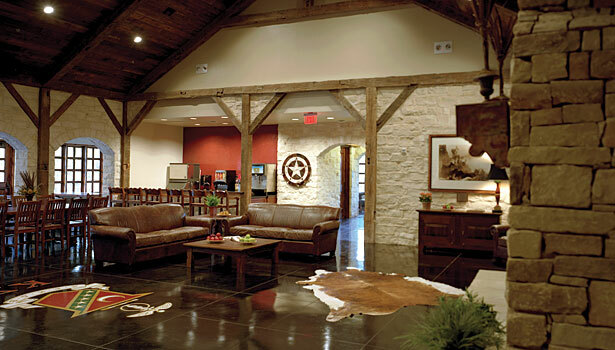 "There wasn't any question about using local limestone for the lodge," said Katheryn Lott, AIA RID, LEED AP BD+C of Katheryn Lott Architects. "There were two fraternity alums that were very involved during the project. One of the alums, from Houston, TX, was involved in the overall design decisions. He said he had seen the regional stone and loved it." The stonework - both inside and out - including the stately arches, directly reflects the Old World European craftsmanship and style of 15th Century Italy. 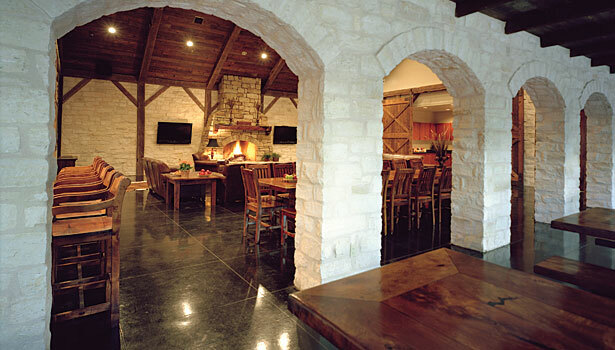 The entire exterior of the Tau chapter's lodge is made of a native cream-colored limestone from the surrounding Austin area. All of the interior walls are the same native stone as the exterior, split on all sides with random heights and lengths. Sizes include a combination of 25% of 4-inch pieces, 30% of 6-inch pieces, 25% of 8-inch pieces and 20% of 10-inch pieces. "A major concern was making sure that all of the materials used were to be durable, and able to withstand constant wear and tear by fraternity members," said Lott. The structural stonework was crafted by using a Tuscan-inspired technique of precisely matching the mortar color to the stone and then hand rubbing it into the surface to give it a clean texture and high-quality finish. "For contrast, the fireplace and chimney were built of Tuscany Hickory stone, split on all sides and of random heights and lengths," explained the architect, adding that the stone was dry-stacked. Alternatively, the concrete floor was stained and sealed to provide a marble-like finish, making the Kappa Sigma Crest the focal point of the Great Room. Though there weren't any other types of stone considered, the selection process was still very in depth. Prior to construction of the stone walls, the contractor built three sample boards on site so that Lott and the building committee representatives could choose the right mortar color and technique. The architect explained that she spent a great deal of time on the jobsite during construction. "We had weekly construction meetings," she said. "One of the alums lives in Austin and was here to attend the meetings - making decisions and keeping the project on schedule." The reaction to the lodge has been very well received as the pledge classes have increased in size for the last two years since its opening. 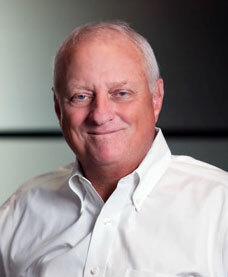 "Membership has increased from 66 members in 2009 to 184 members in 2012," said Lott. 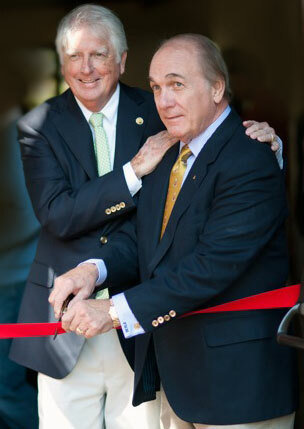 The Lodge was completed and dedicated in November 2010 and is said to "embody the strength, character and spirit of the Kappa Sigma Renaissance predecessors of Bologna."